I just had to show off the birthday present that my nephew made for me - a natural driftwood hook using old square nails as the hooks. I've hung it in my kitchen to serve as organized storage for measuring spoons, utensils, dried herbs and the like. Finding simple ways to organize the practical items in my kitchen allows me to feel less cluttered and more able to enjoy cooking and baking. 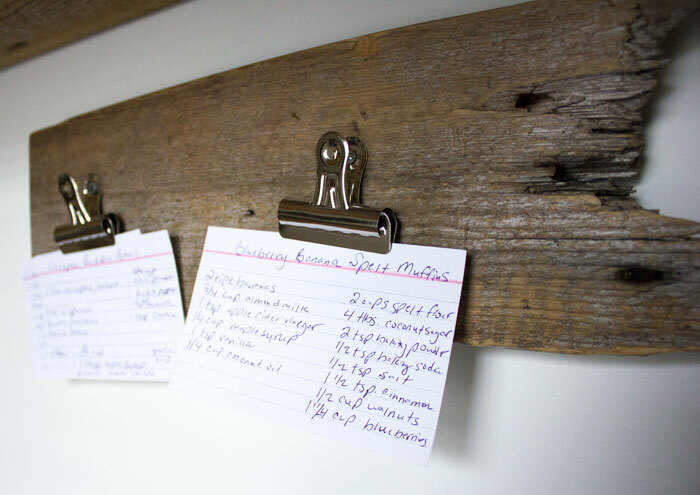 I use other DIY salvaged wood pieces in my kitchen as well to function as practical and beautiful storage. Live edge wood cutting boards lean against the backsplash so they're easy to grab and a cedar trivet is used interchangeably as a centrepeice and serving tray. These pieces add warmth and a ruggedness that mimics the woodlot that surrounds my home. A broken piece of barnboard with clips nailed into it hold my favourite recipes. And a salvaged old driftwood plank becomes a handy shelf above the stove. It's simply held up with two other pieces of driftwood cut at 45 degree angles. Salvaged barn board that's sanded down is also used to put together a simple tray to keep my spices and one for my coffee station. They're cut to to the preferred size with 45-degree angles, and I used an air nailer and glue to piece them together. I don't do much to these salvaged pieces of wood except sand them down so there are no sharp edges and so that their natural wood grain and imperfections shine through. It's a very cheap and easy and sustainble way to decorate a kitchen for both function and natural beauty!